Corona Del Mar High School. 3. Before starting your business, what were you doing? Fashion design while living in New York. 4. Where did you get the name, Goldsheep? 5. 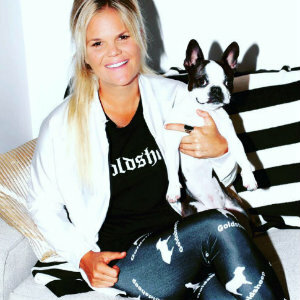 What is different about Goldsheep from other legging brands? Every legging is handmade on demand at the time the order is placed. Each piece is a work of art, with every print telling a different story. 6. How many employees at Goldsheep? 7. In terms of production, how many pieces are you making each month? There is no set number each month because every piece is made on demand so it varies throughout the year. 8. Where are they made? Goldsheep was started in Laguna Beach, but we outgrew the space so today, all the production takes place at our office in Costa Mesa. 9. Where can we find Goldsheep? You can find every legging available for purchase on our online store, but we also sell in multiple retailers around the world! Several studios such as Corepower Yoga, Pure Barre, Barre3 and various spin studios carry Goldsheep. Numerous boutique stores have a selection of Goldsheep available for purchase as well (we list all on our website under ‘Retailers’). Everywhere. Travel, pop culture, music, art, people - I am constantly taking pictures with my phone which results in new prints. Getting to show my line at London Fashion Week. Still at Goldsheep, but it will be a huge pop art, lifestyle brand with many divisions. I see an amazing artistic team surrounding me where I am able to show my true vision. 13. What are you most excited about? Working with new people and companies every day. I do a ton of custom projects that really fulfill my passion to create. 14. What’s next on your to-do list? 1. Expand my current line. Each day is different. You always think you have a plan, but being an owner plans are thrown out the window. No matter what, I always make sure that I get to be creative every day I come to work. 16. What advice would you give a younger person who was interested in starting a clothing company? Find a mentor. Someone who has already done it and work under them. Do not try and reinvent the wheel. 17. What obstacles do you come across? Too many to write. There is a reason why not a lot of people do what I do - hand make every item and run a production house. Managing employees is one of the hardest parts, and I have had more than one person try to copy Goldsheep. 18. What’s the last vacation you went on? My brother’s wedding in Greece. 19. What do you do in your off-time to relax? SoulCycle classes, Exercise; it’s the only way to clear my head. 20. A secret most people don’t know about you? I am super spiritual and always have crystals around me. I’m obsessed with vision boards.